Content curation helps brands increase their visibility and their customer engagement. This blog post by Therese Torris explains very well how brands can leverage content curation as part of an effective content marketing strategy. Rather than contributing to the “ongoing content inflation”, she decided to embrace curation as “there is more smart content online than anybody could ever read”. – Easier content discovery. 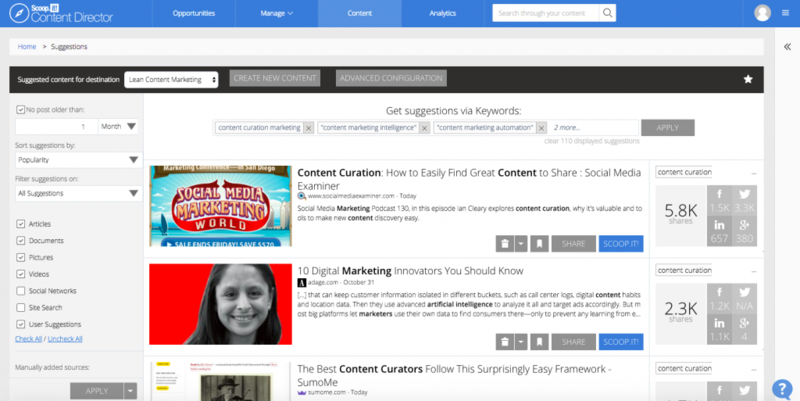 Curation is an efficient way to discover and share content on your favorite topics. It embeds brand content into a rich inbound context of external content. – Social content curation fosters customer engagement. Curating a brand’s content not only send it traffic, it also brings to the brand and its product a much-needed validation. – Corporate curation tools help create a competitive advantage. It is recommended that brands use collaborative content curation tools in addition to public social curation platform to listen to their market, optimize their content and collaborate on their content strategy. Warning – curated content supplements original content, but cannot replace it. A brand must have a story to tell, original content and topics to share, otherwise curated content will only increase the overall online noise level. The capacity to identify external sources, search through them and extract data that will point to selected sources is one of the main benefits of curation tools. Our content marketing automation tool, Scoop.it Content Director, helps you get fresh content automatically – simply choose relevant keywords, and let the magic happen! The second virtue of content curation tools lies in how they help curators re-organize content from different sources into topics. Once aligned to topics, content is more easily discovered and shared by people with common interests. Repurposing content is a valuable lean strategy – it helps reaching a new audience, and extends the lifetime of successful posts. 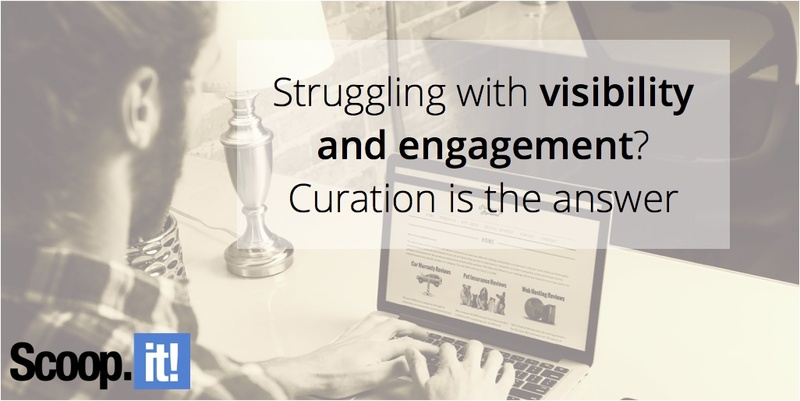 Curation tools are versatile publishing tools – they enable curators to easily publish content on multiple media without the hassle. Sharing topics with your audience and being active on social curation sites increase your chances to be discovered in a relevant context. 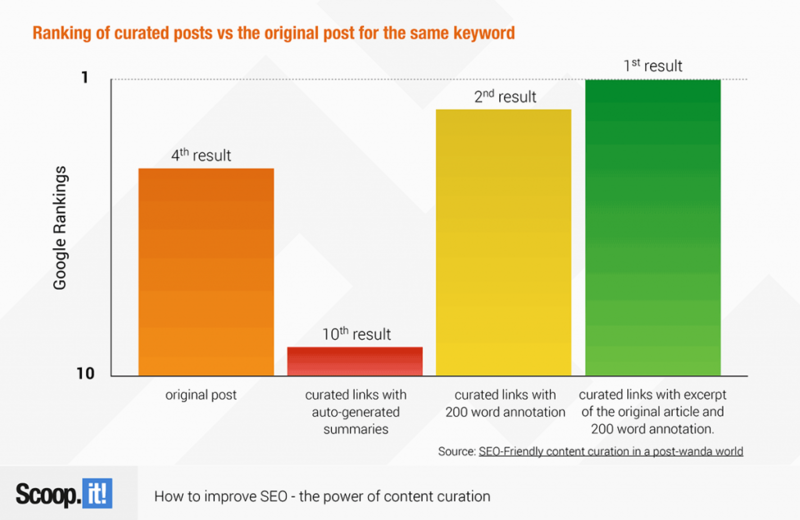 And considering curated posts even help you get better SEO rankings! Don’t believe me? Check out that study done by Bruce Clay, a digital marketing optimization company – they proved content curation could move you from 4th position to 1st position in Google! Fresh content: It’s not easy to produce fresh content every day; for instance, you could enrich your website with an automated Newsfeed section. Optimized content: some curation tools give you real-time information on trending keywords and topics. Rich media: Pictures and videos are a must! Trust: Curating content from actors in your space will get you noticed by them. You therefore create a relationship with them, and that can only turn into a positive benefit for your brand. Entertaining content: You should definitely consider user-generated content like You Tube videos, for instance. It can be really fun! So here it is, I believe the reasons explained above are enough for you marketers to start curating content, if you haven’t consider it already. Curation tools are here to help you create content faster, and better. On the top of that, you will get better results in terms or customer engagement and online visibility. 2 Comments on "Struggling with visibility and engagement? Curation is the answer"
Can you please update the attribution of the main image. Our license states it should be linked to https://thoroughlyreviewed.com and not our Flickr account.